The Company strives to maintain high level of corporate governance and has always adhered to excellent, prudent and efficient corporate governance principles and continuously improves its corporate governance methodology, regulates its operations, improves its internal control mechanism, implements sound corporate governance and disclosure measures, and ensures that the Company's operations are in line with the long-term interests of the Company and its shareholders as a whole. In 2018, the shareholders' meeting, the Board and the Supervisory Committee operate soundly and efficiently, and the Company insisted on reform and innovation and strived to promote corporate transformation and upgrades, while continuously optimising its internal control system and comprehensive risk management in order to effectively ensure corporate steady operation. The standard of the Company's corporate governance continued to improve and is aligned with the long-term best interest of shareholders, ensuring that the interests of shareholders were effectively assured. The Company persists in refining the basic system of its corporate governance. As a company incorporated in the PRC, the Company adopts the Company Law of the People's Republic of China and other relevant laws and regulations as the basic guidelines for the Company's corporate governance. As a company dual-listed in Hong Kong and the United States, the Company strives to ensure compliance with the Rules Governing the Listing of Securities on The Stock Exchange of Hong Kong Limited (the "Listing Rules") and the regulatory requirements for non-US companies listed in the United States. In addition, the Company has regularly published statements relating to its internal control in accordance with the US Sarbanes-Oxley Act and the regulatory requirements of the SEC and the New York Stock Exchange to confirm its compliance with related financial reporting, information disclosure, corporate internal control requirements and other regulatory requirements. For the financial year ended 31 December 2018, the roles of Chairman and Chief Executive Officer of the Company were performed by the same individual. In the Company's opinion, through supervision by the Board and the Independent Non-Executive Directors, with effective control of the Company's internal check and balance mechanism, the same individual performing the roles of Chairman and Chief Executive Officer can enhance the Company's efficiency in decision-making and execution and effectively capture business opportunities. Many leading international corporations around the world also have similar arrangements. The Company attaches high importance to the annual general meeting which provides an opportunity for direct communication between the Board of Directors of the Company and the shareholders. Mr. Yang Jie, the then Chairman of the Company, was unable to attend the annual general meeting of the Company for the year 2017 convened on 28 May 2018 due to other important work arrangement. Therefore, another executive director was appointed to chair the said annual general meeting and answer the questions raised by the shareholders. Save as stated above, the Company was in compliance with all the code provisions under the Corporate Governance Code as set out in Appendix 14 to the Listing Rules in the year 2018. In 2018, the Company's continuous efforts in corporate governance gained wide recognition from the capital markets and the Company was accredited with a number of awards. The Company was named the "Most Honoured Company (2009-2018)" in the Asia's Best Managed Companies Poll 2018 by FinanceAsia. The Company was voted as the "Most Honoured Company in Asia" in 2018 All-Asia-Executive-Team ranking organised by Institutional Investor, a prestigious financial magazine, for eight consecutive years. The Company was voted as the "Most Outstanding Company in Hong Kong — Telecommunication Services Sector" in the Asia's Outstanding Companies Poll 2018 by Asiamoney, and was the only telecom operator in China and Hong Kong to have received such an honour. The Company was accredited with "Platinum Award — Excellence in Environmental, Social and Governance" in the poll of Corporate Awards 2018 by The Asset, and was the only telecommunications company that received the Platinum recognition for 10 consecutive years. Meanwhile, the Company was honoured with four other top awards, of which Mr. Yang Jie, the then Chairman and CEO of the Company, was awarded with the "Best CEO in Telecommunications" for his excellence in leadership, strategic thinking, team- and relationship-building, effective communication and change management. The Company was also awarded "Best Initiative in Diversity and Inclusion" for adopting policies, programs and practices that promote and strengthen diversity and inclusion within the organisation as well as in the community and industry. In addition, the Company was accredited with "The Best of Asia — Icon on Corporate Governance" by Corporate Governance Asia, a renowned regional journal on corporate governance, for six consecutive years, and Mr. Yang Jie was honoured with "Asia's Best CEO" award. A two-tier structure is adopted as the overall structure for corporate governance: the Board and the Supervisory Committee are established under the shareholders' meeting; the Audit Committee, Remuneration Committee and Nomination Committee are established under the Board. The Board is authorised by the Articles of Association to make major operational decisions of the Company and to oversee the daily management and operations of the senior management. The Supervisory Committee is mainly responsible for the supervision of the performance of duties of the Board and the senior management. Each of the Board and the Supervisory Committee is independently accountable to the shareholders' meeting. In 2018, the Company convened 3 shareholders' meetings including an annual general meeting ("AGM") for the year 2017 and 2 extraordinary general meetings ("EGM"). At the first EGM held on 4 January 2018, the amendments to the Articles of Association of the Company including the updates of contact information of the Company, setting up Party organisations in the Company, the amendment to the number of announcements in newspaper in the events of reducing its registered capital, merger, division and establishment of liquidation committee, change of the way of affixing the seal on share certificates and updated description on dividend payment were reviewed and approved. At the AGM held on 28 May 2018, numerous resolutions such as the consolidated financial statements for the year 2017 of the Company, report of the international auditor, proposal for profit and dividend distribution, re-appointment of auditors and amendments to the Articles of Association of the Company (which mainly include the updates of the provisions regarding the Company's scope of business) were reviewed and approved. No significant changes to the Articles of Association of the Company during the year were made. Meanwhile, the Board was authorised to prepare the budget for the year 2018, fix the remuneration of the auditors and issue debentures, etc.. At the second EGM held on 26 October 2018, the renewal of the continuing connected transactions and the applicable renewed annual caps thereto, the election of Madam Zhu Min and Mr. Yeung Chi Wai, Jason as a Director and independent Director of the Company respectively and the election of Mr. Xu Shiguang as a Supervisor of the Company were approved. Since the Company's listing in 2002, at each of the shareholders' meetings, a separate shareholders' resolution was proposed by the Company in respect of each independent item. The circulars to shareholders also provided details of the resolutions. All votes on resolutions tabled at the shareholders' meetings of the Company were conducted by poll and all voting results were published on the websites of the Company and The Stock Exchange of Hong Kong Limited. The Company attaches great importance to the shareholders' meetings and the communication between Directors and shareholders. The Directors provided detailed and sufficient answers to the questions raised by shareholders at the shareholders' meetings. The Board implemented the Shareholders Communication Policy to ensure that the shareholders are provided with comprehensive, equal, understandable and public information of the Company on a timely basis and to facilitate the communication amongst the Company, the shareholders and investors. As at 31 December 2018, the Board of the Company comprised 10 Directors including 5 Executive Directors, 1 Non-Executive Director and 4 Independent Non-Executive Directors. The Audit Committee, Remuneration Committee and Nomination Committee under the Board consist solely of Independent Non-Executive Directors, which ensure that the Committees are able to provide sufficient check and balance, and make independent judgements to protect the interests of shareholders and the Company as a whole. The number of Independent Non-Executive Directors exceeds one-third of the members of the Board of the Company. Mr. Tse Hau Yin, Aloysius, the Chairman of the Audit Committee, is an internationally renowned financial expert with extensive expertise in accounting and financial management. The term of office for the 6th session of the Board lasts for 3 years, starting from May 2017 until the day of the Company's annual general meeting for the year 2019 to be held in 2020, upon which the 7th session of the Board will be elected. In August 2013, the Company implemented the Board Diversity Policy. The Company strongly believes that board diversity will contribute significantly to the enhancement of the overall performance of the Company. The Company views board diversity as the key element for accomplishing its strategic goals and sustainable development. In determining the composition of the Board, the Company takes into account diversity of the Board from a number of perspectives, including but not limited to gender, age, education background or professional experience, skills, knowledge, duration of service and time commitment, etc. All appointments made or to be made by the Board are merit-based, and candidates are selected based on objective criteria taking full consideration of board diversity. Final decisions are comprehensively made based on each candidate's attributes and the consideration for his/her value contributions to be made to the Board. The Nomination Committee oversees the implementation of Board Diversity Policy, reviews the existing policy as and when appropriate, and recommends proposals for revisions for the Board's approval. In 2018, the Board and the Nomination Committee proposed to appoint Madam Zhu Min ("Madam Zhu") and Mr. Yeung Chi Wai, Jason ("Mr. Yeung") as an Executive Director and an Independent Non-Executive Director of the Company respectively. When conducting the evaluation on the candidates, the Board and the Nomination Committee take into account the diversity of the Board and relevant policies. The Board and the Nomination Committee considered that Madam Zhu has extensive experience in finance, management and the telecommunications industry and her appointment to the Board can maintain the proportion of female members in the Board composition. There are currently two female Directors on the Board. Meanwhile, Mr. Yeung is considered as independent and has extensive experience in handling legal, regulatory, compliance and banking matters, and is familiar with relevant laws and regulations. He also complies with the guidelines on independence as set out in Rule 3.13 of the Listing Rules and has sufficient time to discharge his responsibilities as an Independent Non-Executive Director of the Company. The Board believes that the appointments of Madam Zhu and Mr. Yeung as Board members can further strengthen supervision and management capabilities in finance and legal areas. They can bring different views and perspectives to the Board and further enhance board diversity while promoting the independence and objectiveness in decision-making of the Board and the comprehensive and impartial supervision of the management in accordance with the interests of the Company and its shareholders as a whole. The appointments of Madam Zhu and Mr. Yeung as Directors were approved at the second EGM held on 26 October 2018 by the Company. Biographical details of existing Directors are set out in the "Biographical details of Directors, Supervisors and Senior Management" section of this Annual Report. The Company considers that the Board currently comprises experts from diversified professions such as telecommunications, accounting, finance, law, banking and management with diversification in terms of gender, age, duration of service, etc., advancing the enhancement of management standard and the further standardisation of corporate governance practices, which results in a more comprehensive and balanced Board structure and decision-making process. The Company strictly complies with the Corporate Governance Code under the Listing Rules to rigorously regulate the operating procedures of the Board and its Committees, and to ensure that the procedures of the Board meetings are in compliance with related rules in terms of organisation, regulations and personnel. The Board responsibly and earnestly supervises the preparation of financial statements for each financial period, so that such financial statements truly and fairly reflect the financial condition, the operating results and cash flows of the Company for such period. In preparing the financial statements for the year ended 31 December 2018, the Directors adopted appropriate accounting policies and made prudent, fair and reasonable judgements and estimates, and prepared the financial statements on a going concern basis. The Articles of Association of the Company clearly defines the respective duties of the Board and the management. The Board is accountable to the shareholders' meetings, and its duties mainly include the execution of resolutions, formulation of major operational decisions, financial proposals and policies, formulation of the Company's basic management system and the appointment of senior management personnel of the Company. The management is responsible for leading the operation and management of the Company, the implementation of Board resolutions and the annual operation plans and investment proposals of the Company, formulating the proposal of the Company's internal administrative organisations and sub-organisations, and performing other duties as authorised by the Articles of Association and the Board. In order to maintain highly efficient operations, as well as flexibility and swiftness in operational decision-making, the Board may delegate its management and administrative powers to the management when necessary, and shall provide clear guidance regarding such delegation so as to avoid impeding or undermining the capabilities of the Board when exercising its powers as a whole. All members of the Board/Committees are informed of the meeting schedule for the Board/Committees for the year at the beginning of each year. In addition, all Directors will receive meeting notice at least 14 days prior to the meeting under normal circumstances. The Company Secretary is responsible for ensuring that the Board meetings comply with all procedures, related rules and regulations while all Directors can make enquiries to the Company Secretary for details to ensure that they have received sufficient information on various matters set out in the meeting agendas. The Board holds at least 4 meetings in each year. Additional Board meetings will be held in accordance with practical needs. In 2018, the Board played a pivotal role in the Company's operation, budgeting, supervision, internal control, risk management and other significant decisions and corporate governance. The Board reviewed significant matters including the Company's annual and interim financial statements, quarterly financial results, financial and investment budgets, risk management and internal control implementation and assessment report, annual proposal for profit distribution, share appreciation rights scheme and the grant proposal, renewal of the continuing connected transactions, and the applicable renewed annual caps thereto, the implementation of continuing connected transactions, changes of Directors and Board Committee members, Supervisors and senior management, remuneration proposal for the newly appointed Directors, re-appointment and remuneration of auditors, establishment of independent board committee and appointment of independent financial adviser and implementation of new Lease Standard. During the year, the Company convened 4 Board meetings and completed various written resolutions. In 2018, the Chairman held a meeting to communicate with Non-Executive Directors (including Independent Non-Executive Directors) without the presence of Executive Directors independently to ensure their opinions can be fully expressed, further facilitating the exchange of different views on the Board. The Company determines the Directors' remuneration with reference to factors such as their respective duties and responsibilities in the Company, as well as their experience and market conditions at the relevant time. The Board formulates and reviews the Company's policies and practices on corporate governance; reviews and monitors the training and continuous professional development of Directors and senior management; reviews and monitors the Company's policies and practices on compliance with legal and regulatory requirements; develops, reviews and monitors the code of conducts for employees; and reviews the Company's compliance with the Corporate Governance Code and disclosure in the Corporate Governance Report. The Company provides guidelines on duties, continuing obligations, relevant laws and regulations, operation and business of the Company to newly appointed Directors so that they are provided with the tailored induction relating to their appointment. To ensure that the Directors are familiar with the Company's latest operations for decision-making, the Company arranges for key financial data and operational data to be provided to the Directors on a monthly basis. Meanwhile, through regular Board meetings and reports from management, the Directors are able to have clearer understandings on the operations, business strategy, the latest development of the Company and the industry. In addition, the Company reminds the Directors of their functions and duties by continuously providing them with information regarding the latest development of the Listing Rules and other applicable regulations, and arranging internal training on topics related to the latest development of the industry and operational focus of the Company for mutual exchange of ideas and discussion. The Directors actively participate in training and continuous professional development to develop and refresh their knowledge and skills in order to contribute to the Company. The Company has adopted the Model Code for Securities Transactions by Directors of Listed Issuers as set out in Appendix 10 to the Listing Rules to govern securities transactions by the Directors and Supervisors. Based on the written confirmation from the Directors and Supervisors, the Company's Directors and Supervisors have strictly complied with the Model Code for Securities Transactions by Directors of Listed Issuers in Appendix 10 to the Listing Rules regarding the requirements in conducting securities transactions for the year 2018. Meanwhile, the Company has received annual independence confirmation from each of the Independent Non-Executive Directors and considered them to be independent. As at 31 December 2018, the Audit Committee comprised 4 Independent Non- Executive Directors, Mr. Tse Hau Yin, Aloysius as the Chairman and Mr. Xu Erming, Madam Wang Hsuehming and Mr. Yeung Chi Wai, Jason as the members. On 26 October 2018, Mr. Yeung Chi Wai, Jason was appointed as a member of Audit Committee. The Audit Committee is responsible to the Board. The Charter of the Audit Committee clearly defines the status, structure and qualifications, work procedures, duties and responsibilities, funding and remuneration, etc. of the Audit Committee. The Audit Committee's principal duties include the supervision of the truthfulness and completeness of the Company's financial statements, the effectiveness and completeness of the Company's internal control and risk management systems as well as the work of the Company's Internal Audit Department. It is also responsible for the supervision and review of the qualifications, selection and appointment, independence and services of external independent auditors. The Audit Committee ensures that the management has discharged its duty to establish and maintain an effective risk management and internal control system including the adequacy of resources, qualifications and experience of staff fulfilling the accounting, internal control and financial reporting function of the Company together with the adequacy of the staff's training programmes and the related budget. The Audit Committee also has the authority to set up a reporting system on whistleblowing to receive and handle cases of complaints or complaints made on an anonymous basis regarding the Company's accounting, internal control and audit matters. Any complaints on the aforementioned subject matters can be submitted by post (31 Jinrong Street, Xicheng District, Beijing 100033, China) or phone (86-18911351635).The Audit Committee is responsible to and regularly reports its work to the Board. In 2018, pursuant to the requirements of the governing laws and regulations of the places of listing and the Charter of the Audit Committee, the Audit Committee fully assumed its responsibilities within the scope of the clear mandate from the Board. The Audit Committee proposed a number of practical and professional recommendations for improvement based on the Company's actual circumstances in order to promote the continuous improvement and perfection of corporate management. The Audit Committee has provided important support to the Board and played a significant role in protecting the interests of independent shareholders. In 2018, the Audit Committee convened 5 meetings and passed 1 written resolution, in which it reviewed important matters related to the Company's annual and interim financial statements, quarterly financial results, assessment of the qualifications, independence, performance, appointments and remuneration of the external auditors, effectiveness of risk management and internal control systems, internal audit, renewal of the continuing connected transactions and the applicable renewed annual caps thereto, implementation of continuing connected transactions and the implementation of new Lease Standard. The Audit Committee reviewed the annual auditor's report, interim review report and quarterly agreed-upon procedures reports prepared by the external auditors, communicated with the management and the external auditors in regards to the regular financial reports and proposed them for the Board's approval after review and approval. The Audit Committee regularly received risk management reports, quarterly reports in relation to the internal audit and continuing connected transactions and provided guidance to the Internal Audit Department. Additionally, the Audit Committee reviewed the internal control assessment and the attestation report, followed up with the implementation procedures of the recommendations proposed by the external auditors, reviewed the U.S. annual report, and communicated independently with the external auditors twice a year. On 17 December 2018, the Charter of the Audit Committee was amended to reflect the changes to the Listing Rules relating to the independence requirement of Committee members. As at 31 December 2018, the Remuneration Committee comprised 3 Independent Non-Executive Directors, Mr. Xu Erming as the Chairman and Mr. Tse Hau Yin, Aloysius and Madam Wang Hsuehming as the members. The Remuneration Committee is responsible to the Board. The Charter of the Remuneration Committee clearly defines the status, structure and qualifications, work procedures, duties and responsibilities, funding and remuneration, etc. of the Remuneration Committee. The Remuneration Committee assists the Company's Board to formulate overall remuneration policy and structure for the Company's Directors and senior management personnel, and to establish related procedures that are standardised and transparent. The Remuneration Committee's principal duties include supervising the compliance of the Company's remuneration system with legal requirements, presenting the evaluation report on the Company's remuneration system to the Board, giving recommendations to the Board in respect of the overall remuneration policy and structure for the Company's Directors and senior management personnel and the establishment of a formal and transparent procedure for developing remuneration policy, and determining, with delegated responsibility by the Board, the remuneration packages of individual executive directors and senior management personnel including benefits in kind, pension rights and compensation payments (including any compensation payable for loss or termination of their office or appointment). Its responsibilities comply with the requirements of the Corporate Governance Code. The Remuneration Committee convened 1 meeting and completed 1 written resolution in 2018, in which it reviewed and discussed the remuneration proposal for the newly appointed Directors, share appreciation rights scheme and the grant proposal. On 17 December 2018, the Charter of the Remuneration Committee was amended to reflect the change to the independence requirement of Committee members. As at 31 December 2018, the Nomination Committee comprised 3 Independent Non-Executive Directors, Madam Wang Hsuehming as the Chairlady and Mr. Tse Hau Yin, Aloysius and Mr. Xu Erming as the members. On 28 May 2018, Madam Cha May Lung, Laura resigned from her positions as a member and the Chairlady of the Nomination Committee of the Company. On the same date, Madam Wang Hsuehming was appointed as a member and the Chairlady of the Nomination Committee of the Company. The Nomination Committee is responsible to the Board. The Charter of the Nomination Committee clearly defines the status, structure and qualifications, work procedures, duties and responsibilities, funding and remuneration, etc. of the Nomination Committee, and it specifically requires that the Nomination Committee members shall have no significant connection to the Company, and comply with the regulatory requirements related to "independence". The Nomination Committee assists the Board to formulate standardised, prudent and transparent procedures for the appointment and succession plans of Directors, and to further optimise the composition of the Board. The principal duties of the Nomination Committee include regularly reviewing the structure, number of members, composition and diversity of the Board; identifying candidates and advising the Board with the appropriate qualifications for the position of Directors; reviewing the Board Diversity Policy as appropriate to ensure its effectiveness; evaluating the independence of nominees for Independent Non-Executive Directors; advising the Board on matters regarding the appointment or re-appointment of Directors (especially Chairman and Chief Executive Officer) and succession plans for the Directors. The Nomination Committee convened 1 meeting and passed 1 written resolution in 2018, in which it performed a review of the structure and operations of the Board and the proposed candidate for Director and other related matters. Pursuant to the requirement under the Listing Rules, the Company convened 1 Independent Board Committee meeting in 2018, with all 3 Independent Non-Executive Directors attended where it reviewed the renewal of the continuing connected transactions and the applicable renewed annual caps thereto and gave the relevant confirmation as well as submitted the recommendations on these matters to the independent shareholders. Note: Certain Directors (including Non-Executive Director and Independent Non-Executive Directors) could not attend some of the shareholders' meetings, Board meetings and other Committee meetings due to other important business commitments. Such Directors have reviewed the relevant meeting agendas and papers before the meetings and authorised other Directors in writing to vote on their behalf so as to ensure their views were fully reflected in the meetings. * On 29 January 2018, Mr. Sun Kangmin retired from his positions as an Executive Director and an Executive Vice President of the Company due to his age. On 28 May 2018, Madam Cha May Lung, Laura resigned from her positions as an Independent Non-Executive Director as well as a member and the Chairlady of the Nomination Committee of the Company due to her intention to focus on other business commitments and engagement. On the same date, Madam Wang Hsuehming was appointed as a member and the Chairlady of the Nomination Committee of the Company. On 19 July 2018, Mr. Liu Aili resigned from his positions as an Executive Director, President and Chief Operating Officer of the Company due to change in work arrangement. On 26 October 2018, the appointments of Madam Zhu Min and Mr. Yeung Chi Wai, Jason, as a Director and an Independent Director of the Company respectively were approved at the extraordinary general meeting of the Company. On the same date, Mr. Yeung Chi Wai, Jason was appointed as a member of the Audit Committee of the Company. The Company will identify suitable Director candidates through multiple channels such as internal recruitment and recruiting from the labour market. The criteria of identifying candidates include, but not limited to, their gender, age, educational background or professional experience, skills, knowledge and length of service and capability to commit to the affairs of the Company and, in the case of Independent Non-Executive Director, the candidates should fulfill the independence requirements set out in the Listing Rules from time to time. After the Nomination Committee and the Board have reviewed and resolved to appoint the appropriate candidate, the relevant proposal will be put forward in writing to the shareholders' meeting for approval. Directors shall be elected at the shareholders' meeting for a term of 3 years. At the expiry of a Director's term, the Director may stand for re-election and re-appointment. According to the Articles of Association, before the convening of the annual general meeting, shareholders holding 5% or more of the total voting shares of the Company shall have the right to propose new motions (such as election of Directors) in writing, and the Company shall place such proposed motions on the agenda for such annual general meeting if there are matters falling within the functions and powers of shareholders in General Meetings. According to the Articles of Association, shareholders can also request for the convening of extraordinary general meeting provided that 2 or more shareholders holding in aggregate 10% or more of the shares carrying the right to vote at the meeting sought to be held and they shall sign one or more written requisitions in the same format and with the same content, requiring the Board to convene an extraordinary general meeting and stating the resolutions of meeting (such as election of Directors). The Board shall convene an extraordinary general meeting within 2 months. The minimum period during which written notice given to the Company of the intention to propose a person for election as a Director, and during which written notice to the Company by such person of his/her willingness to be elected may be given, will be at least 7 days. Such period will commence no earlier than the day after the despatch of the notice of the meeting for the purpose of considering such election and shall end no later than 7 days prior to the date of such meeting. The ordinary resolution to approve the appointment of Directors shall be passed by votes representing more than one-half of the voting rights represented by the shareholders (including proxies) present at the meeting. As at 31 December 2018, the Company's Supervisory Committee comprised 5 Supervisors, including 2 Employee Representative Supervisors. The principal duties of the Supervisory Committee include supervising, in accordance with the law, the Company's financials and performance of its Directors, managers and other Senior Management so as to prevent them from abusing their powers. The Supervisory Committee is a standing supervisory organisation within the Company, which is accountable to and reports to all shareholders. The Supervisory Committee usually holds meetings at least twice a year. The Supervisory Committee convened 2 meetings in 2018. The term of office for the 6th session of the Supervisory Committee lasts for 3 years, starting from May 2017 until the day of the Company's annual general meeting for the year 2019 to be held in year 2020, upon which the 7th session of the Supervisory Committee will be elected. Note: Certain Supervisors could not attend some of the meetings of the Supervisory Committee due to other important business commitments. * On 27 February 2018, Mr. Hu Jing resigned from his position as a Supervisor of the Company due to change in work arrangement. On 26 October 2018, the appointment of Mr. Xu Shiguang as a Supervisor of the Company was approved at the extraordinary general meeting of the Company. The international and domestic auditors of the Company are Deloitte Touche Tohmatsu and Deloitte Touche Tohmatsu Certified Public Accountants LLP, respectively. The nonaudit services provided by the external auditors did not contravene the requirements of the US Sarbanes-Oxley Act and therefore enabling them to maintain the independence. The Directors of the Company are responsible for the preparation of consolidated financial statements that give a true and fair view in accordance with the International Financial Reporting Standards as issued by the International Accounting Standards Board and the disclosure requirements of the Hong Kong Companies Ordinance, and for such internal control as the Directors determine is necessary to enable the preparation of consolidated financial statements that are free from material misstatement, whether due to fraud or error. The statements by the external auditors of the Company, Deloitte Touche Tohmatsu, regarding their reporting responsibilities on the consolidated financial statements of the Company is set out in the Independent Auditor's Report on pages 158 to 162. Since the approval at the annual general meeting of the Company for the financial year 2012, the external auditors, Deloitte Touche Tohmatsu and Deloitte Touche Tohmatsu Certified Public Accountants LLP have provided audit services for the Company for six consecutive years. The Audit Committee and the Board of the Company have resolved to re-appoint Deloitte Touche Tohmatsu and Deloitte Touche Tohmatsu Certified Public Accountants LLP as the international and domestic auditors respectively for the financial year 2019, subject to the approval at the 2018 annual general meeting of the Company. The Board attaches great importance to the establishment and perfection of the risk management and internal control systems. The Board is responsible for evaluating and determining the nature and extent of the risks it is willing to take in achieving the Company's strategic objectives, and ensuring that the Company establishes and maintains appropriate and effective risk management and internal control systems, and the Board acknowledges that it is responsible for the risk management and internal control systems and for reviewing their effectiveness. Such systems are designed to manage rather than eliminate the risk of failure to achieve business objectives, and can only provide reasonable but not absolute assurance against material misstatements or losses. The Board oversees management in the design, implementation and monitoring of the risk management and internal control systems. The Board takes effective approaches to supervise the implementation of related control measures, whilst enhancing operation efficiency and effectiveness, and optimising corporate governance, risk assessment, risk management and internal control so that the Company can achieve long-term development goals. The risk management and internal control systems of the Company is built on clear organisational structure and management duties, an effective delegation and accountability system, definite targets, policies and procedures, comprehensive risk assessment and management, a sound financial accounting system, and continuing analysis and supervision of operational performance, which plays a pivotal role in the Company's overall operation. The Company has formulated a code of conduct for the senior management personnel and employees which ensures their ethical value and competency. The Company attaches great importance to the prevention of fraud and has formulated its internal reporting system, which encourages anonymous reporting of situations where employees, especially Directors and senior management personnel, breach the rules. The Company views comprehensive risk management as an important task within the Company's daily operation. Pursuant to regulatory requirements in capital markets of the United States and Hong Kong, the Company has formulated a featured 5-step risk management approach based on risk management theory and practice to achieve closed-loop management of risk identification, risk assessment, key risk analysis, risk reaction and risk management assessment. In continuously strengthening the risk process control and management and focusing on significant risk which may be encountered, the Company established a risk monitoring team, to follow and report the status of risk management and control regularly, improve the collecting mechanism of risk-related information and identify the potential flaws of risk in a timely manner. Following the efforts made over the years, the Company has established a structured and highly-effective comprehensive risk management system and has gradually perfected its comprehensive risk monitoring and prevention mechanism. In 2018, pursuant to the requirement of provision C2 of the Corporate Governance Code promulgated by the Hong Kong Stock Exchange, the Company concentrated resources on the prevention of significant potential risks, and strived to reduce negative effect from significant risks, the Company was not confronted by any major risk event throughout the whole year. The Company has identified, assessed and analysed potential major risks faced by the Company in 2019, including economic and policy environment adaptation risks, business development risks and network and information security risks etc., and has put forward detailed response plans. Through strict and appropriate risk management procedures, the Company will ensure the potential impact from the above risks on the Company is limited and within an expected range. Economic and policy environment adaptation risks: Facing the risks and challenges such as the downward pressure under the macroeconomic environment, upgrade of 5G technology, change of regulatory policies in the industry and complicated and changing international environment, the Company will actively adapt to the change of environment, increase effort on stringent control of accounts receivable, proactively embark the trial and application of 5G and innovation on business models, implement the requirements of regulatory policies, promote comprehensive in-depth reform, improve the outside compliance management system and further enhance the quality, efficiency, and motivation of development. Business development risks: Facing continuously intensified competition in the industry, the Company will insist on customer-oriented focus to build a "Trinity" market value operation system featuring convergence, integration and intelligentisation, promoting cloud-network integration, deepening value operations and promoting high-quality development. Network and information security risks: Facing the all-round risks and challenges of network and information security, the Company will proactively carry out the obligation of network security protection, increase initiatives on security, enhance the network security protection capability and respond to emergencies in a timely and appropriate manner. The Company highly values the compliance with the laws and regulations of the People's Republic of China as well as the places of listing of the Company and where the Company's business operations are located, strictly complies with all laws and regulations and timely and proactively incorporates the laws and regulations into the Company's rules and regulations to protect the Company's legitimate business management, maintain the Company's legitimate rights and support corporate to achieve long-term healthy development target. The Standing Committee of the National People's Congress (the "NPCSC") promulgated the Anti-Unfair Competition Law of the People's Republic of China, which has come into force on 1 January 2018. The amended Anti-Unfair Competition Law of the People's Republic of China defined acts of unfair competition, supplemented unfair competition practices that should be prohibited, clearly identified the rules for confusing behaviour and targets of commercial bribery, strengthened the protection of trade secrets, revised the rules concerning the recognition of prize sales, increased the maximum amount of sales rewards, broadened the terms for unfair competition behaviour in Internet, strengthened the measures for supervision and inspection, and perfected the legal liability systems with priority for civil liability and by paralleling the civil liability and administrative penalty, aggravated the punishment for violations, sorted out and maintained relationship with other laws and regulations. In August 2018, the NPCSC approved the E-Commerce Law of the People's Republic of China, which was formally implemented on 1 January 2019. E-Commerce Law consisted of seven chapters and eighty-nine articles which further regulated the parties conducting e-commerce activities including e-commerce platform operators ("e-commerce platforms"). It was the first time to define and confirm the obligation of e-commerce platforms to protect the consumers' security and request the e-commerce platforms to bear the corresponding responsibility when the obligation is breached. It further refined the regulation for the responsibility of intellectual property infringement on the e-commerce platforms, regulated the industrial and commercial registration and tax collection and management of e-commerce operators, requested the e-commerce operators to publish information when independently terminating the transactions, prohibited fabricating transactions, made up user comments to defraud and mislead consumers, prohibited the e-commerce platforms to abuse the dominant market position and excluded and restricted the competition, regulated the rules of deposits collection and return, marked the ranking of bidding products, etc. On 23 August 2018, the Ministry of Industry and Information Technology promulgated the Notice of Ministry of Industry and Information Technology on Further Regulating Activities to Market Telecommunications Tariff Schemes (the "Notice") and became effective from 23 August 2018. The Notice encouraged the fundamental telecommunications enterprises to provide a tiered discount pricing formula for tariff plans according to the usage amount of the users and simplify the structure of tariff package. In formulating and implementing the tariff plans of packaging and sales, the tariff plans on each respective service should be provided at the same time and should further improve the tariff rates disclosure policy. When promoting the tariff plans, reminder obligation should be carried out for the matters drawing users' attention to the restrictive condition, the validity period and the billing principle, and for the same type of users with the same transaction conditions should be guaranteed with equal rights to the tariff plans. Apart from implementing the latest and newly-amended laws and regulations in a timely manner, the Company also actively and closely monitors forthcoming changes in the relevant laws and regulations in order to strengthen the management of the relevant business operation behaviour, safeguards the effective adherence to relevant laws and regulations so as to ensure that the Company's operations are in full compliance with the laws. Since 2003, based on the requirements of the U.S. securities regulatory authorities and the COSO Internal Control Framework, and with the assistance of other advisory institutions including external auditors, the Company has formulated manuals, implementation rules and related rules in relation to internal control, and has developed the Policies on Internal Control Management and Internal Control Accountability Management to ensure the effective implementation of the above systems. The Company has all along continuously revises and improves the manuals and implementation rules in view of the ever changing internal and external operation environment as well as the requirements of business development over the years. While continuing to improve the internal control related policies, the Company has also been strengthening its IT internal control capabilities, which has improved the efficiency and effectiveness of internal control, enhancing the safety of the Company's information system so that the integrity, timeliness and reliability of data and information are maintained. At the same time, the Company attaches great importance to the control and monitoring of network information safety. The Company persistently optimises the relevant rules and guidances, further defines the responsible entities and regularly commences the inspection of network safety and information safety in order to promote the enhancement of the awareness of network information safety and relevant skills and knowledge. In 2018, based on external regulatories supervision, changes in policy environment, and requirements for prevention and control of the Company's key risks, the Company also took into accounts of various measures and business development of its deepening reforms. In order to focus on responding quickly to market demands and supporting business innovation and operational innovation for enterprises, the Company conducted annual revision of internal control manuals and implementation guidance. Branches at all levels further optimised and improved the list of internal audit authority, strengthened the Company's internal supervision and stringent control on problem ratification, continuously improved internal control procedures and policies for capital utilisation, amended the protection for users' information and customer service related procedures, perfected taxation and e-channel partner management; supplemented the contents of outsourcing management of sales outlets and property leasing management, IDC and Internet services management, funds and accounts management, guarantee and legal issues management. The Internal Audit Department plays a vital role in supporting the Board, the management and the risk management and internal control systems. The functions of the Internal Audit Department, which are independent of the Company's business operations, are complementary with the functions of the external auditors while the Internal Audit Department plays an important role in the monitoring of the Company's internal management. The Internal Audit Department is responsible for internal control assessment of the Company, and provides an objective assurance to the Audit Committee and the Board that the risk management and internal control systems are maintained and operated by the management in compliance with agreed processes and standards. The Internal Audit Department regularly reports the internal audit results to the Audit Committee on a quarterly basis, and reports the internal audit results to the Board through the Audit Committee. The Company has been continuously improving its risk management and internal control systems so as to meet the regulatory requirements of its places of listing, including the United States and Hong Kong, and strengthen its internal control while guarding against operational risk. The Company has adopted the COSO Internal Control Framework (2013) as the standard for the internal control assessment. With the management's internal control testing guidelines and the Auditing Standard No. 5 that were issued by PCAOB as its directives, the Company's internal control assessment system is composed of the self-assessment conducted by the persons responsible for internal control together with the independent assessment conducted by the Internal Audit Department. In order to evaluate the nature of internal control deficiencies and reach a conclusion as to the effectiveness of the internal control system, the Company adopts the following 4 major steps of assessment: (1) analyse and identify areas which require assessment, (2) assess the effectiveness of the design of internal control, (3) assess the operating effectiveness of internal control, (4) analyse the impact of deficiencies in internal control. At the same time, the Company rectifies any deficiencies found during the assessment. By formulating amended "Interim Measures for the Internal Control Assessment", "Manual for the Self-Assessment of Internal Control", "Manual for the Independent Assessment of Internal Control" and other documents, the Company has ensured the assessment procedures are in compliance. In 2018, the Company's Internal Audit Department initiated and coordinated the assessment of internal control all over the Company, and reported the results to the Audit Committee and the Board. Self-assessment of internal control adopts a top-down approach which further reinforces assessment in respect of control points in relation to control environment and material financial statements items. The Company insisted on risk-oriented principles with 100% coverage and focusing on assessing key control areas and control points identified from risk analysis. In 2018, the internal control self-assessment takes the prevention of systemic risk as top priority. Focusing on efforts in the depth and breadth of self-assessment with full exploitation of leading business department in the coordination of self-assessment and risk control, the Company identified major risk, confirmed the key control areas and key control points while conducting self-identification, self-assessment and self-improvement vertically. Focusing on the internal control deficiencies identified during the self-assessment, the Company promptly identified the responsibilities and timely rectified the deficiencies, effectively control and eliminate any potential risks. The Company also worked towards perfecting the systems and procedures, and deepening its governance measures, while continuously enhancing the design and operating effectiveness of internal control. On the basis of risk-oriented independent assessment, the Company continued to strengthen the independent assessment of internal control and increased the assessment strength on the major work, major business and the effectiveness of internal control in key risk areas. In 2018, on the basis of conducting regular and independent assessment of internal control, the Company solidified fundamental risk control capabilities to check the quality on self-assessment of internal control and effectiveness of key internal control, conduct independent assessment on city-level branches, and deeply understand and analyse the risks existed in the grassroots operating units, and seek improvement on the flaws of internal control. We also identified successful experiences and applied them to boarder areas to increase the economic radiation effects while effectively promoting implementation of risk prevention measures in different levels, urging all level units to further enhance self-assessment on working quality and rectification in order to effectively enhancing the quality and effectiveness of assessment, enhancing the self-healing ability and promoting the healthy development of the Company. Furthermore, the Company organised the risk management and internal control assessment team and other relevant departments to closely coordinate with the external auditors' audit of internal control over financial reporting. The internal control audit covered the Company and all its subsidiaries as well as the key processes and control points in relation to material financial statements items. The external auditors regularly communicated with the management in respect of the audit results. All levels of the Company have been attaching great importance to rectifying internal control deficiencies. Focusing on deficiencies identified through self-assessment, independent assessment, internal control audit and audit from National Audit Office, the Company required all units to carry out rectification measures and established a collaborative risk prevention mechanism to promote different professional reporting lines of various departments in the headquarters office to execute vertical supervision and system improvement for the rectification work. To ensure effective rectification, the Company also strengthened the verification and supervision of the rectification measures of internal control deficiencies and issued measures to rectify the audit problem identified. All subordinates entities proactively rectified deficiencies identified from the internal and external assessments on the request from the Company. Through self-assessments and independent assessments conducted at different levels, the Company carried out multi-layered and full-dimensional reviews of its internal control system, and put its utmost efforts into rectifying the problems which were identified. Through this method, the Company was able to ensure the effectiveness of its internal control and successfully passed the year-end attestation undertaken by the external auditors. The Board oversees the Company's risk management and internal control systems on an on-going basis and the Board, through the Audit Committee, conducted an annual review of the risk management and internal control systems of the Company and its subsidiaries for the financial year ended 31 December 2018, which covered all material areas including financial controls, operational controls and compliance controls, as well as its risk management functions. After receiving the reports from the Internal Audit Department and the confirmation from the management to the Board on the effectiveness of the Company's risk management and internal control systems (including Environmental, Social and Governance risk management and internal control systems), the Board is of the view that these systems are solid, well-established, effective and sufficient. The annual review also confirms the adequacy of resources relating to the Company's accounting, internal control and financial reporting functions, the sufficiency of the qualifications and experience of staff, together with the adequacy of the staff's training programmes and the relevant budget. The Company established an Investor Relations Department which is responsible for providing shareholders and investors with the necessary information, data and services in a timely manner. It also maintains proactive communications with shareholders, investors and other capital market participants so as to allow them to fully understand the operation and development of the Company. The Company's senior management presents the annual results and interim results every year. Through various activities such as analyst meetings, press conferences, global investor telephone conferences and investors road shows, senior management provides the capital market and media with important information and responds to key questions which are of prime concerns to the investors. This has helped to reinforce the understanding of the Company's business and the overall development of the telecommunications industry in China. Since 2004, the Company has been holding the Annual General Meetings in Hong Kong to provide convenience and encourage its shareholders, especially the public shareholders, to actively participate in the Company's Annual General Meetings and to promote direct and two-way communications between the Board and shareholders. Meanwhile, the Company set up a dedicated investor relations enquiry line, for the purpose of providing a direct channel to address enquiries from the investment community. This allows the Company to better serve its shareholders and investors. 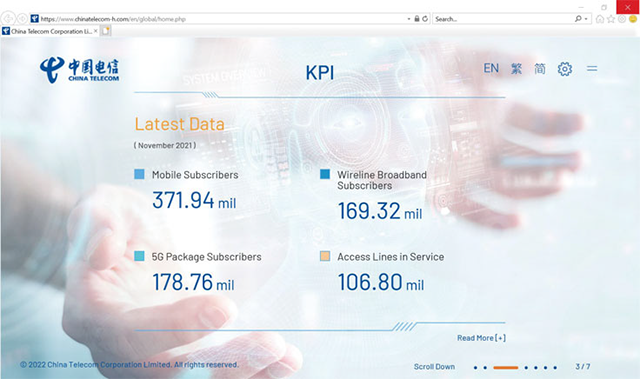 With an aim of strengthening communications with the capital market and enhancing transparency of information disclosure, the Company has provided quarterly disclosure of revenue, operating expenses, EBITDA, net profit figures and other key operational data, and monthly announcements of the number of access lines in service, mobile and wireline broadband subscribers. The Company attaches great importance to maintaining daily communication with shareholders, investors and analysts. In 2018, the Company participated in a number of investor conferences held by a number of major international investment banks in order to maintain active communication with institutional investors. The Company's investor relations website (www.chinatelecom-h.com) not only serves as an important channel for the Company to disseminate press releases and corporate information to investors, media and the capital market, but also plays a significant role in the Company's valuation and our compliance with regulatory requirements for information disclosure. The Company launched a responsive website with the latest technology, which allows automatic adjustment to fit for different screen resolution and user interface, assuring the best browsing experience of website content with desktop computers, laptops or mobile devices. This allows investors, shareholders, reporters and the general public to browse the updated information on the Company's website with any device more easily and promptly anytime anywhere. The Company's website is equipped with a number of useful functions including interactive stock quote, interactive KPI, interactive FAQs, auto email alerts to investors, downloading to excel, RSS Feeds, self-selected items in investors briefcase, html version annual report, financial highlights, investor toolbar, historical stock quote, add investor events to calendars, content sharing to social media, etc. In addition to setting up a dedicated investor relations enquiry line, a specialised appointment function to schedule a meeting with investor relations professionals was also launched on the Company's website, to promote direct and close communication between the Company and investors, as well as to increase transparency. 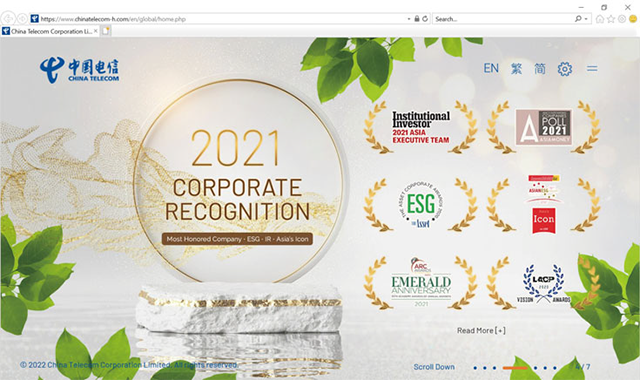 The Company's website was accredited a number of awards including the "Best Website" by Institutional Investor, and "Best IR Website Award" by IR Magazine, indicating that the Company's website is highly recognised by the professionals. The Company also strives to enhance the disclosure quality and format of annual report. The Company further enhanced the transparency of disclosure in environmental, social and governance areas, by following Environmental, Social and Governance Reporting Guide, Appendix 27 of Listing Rules, to report the Company's achievements and key performance indicators on environmental protection, while also took initiative to add quantitative disclosures on social responsibility. The data disclosed was analysed and assessed by independent third party to ensure compliance with relevant requirements. The Company also actively seeks recommendations on how to improve the Company's annual report from shareholders through survey, and prepared and distributed the annual report in a more environmentally-friendly and cost-saving manner according to the recommendations received. Shareholders can ascertain their choice of receiving the annual reports and communications by electronic means, or receiving printed version in English and/or Chinese. The Company clearly and precisely delivered the messages about its strategies and goals in its 2017 Annual Report "Co-Building Our Smart Future", so that shareholders and investors can easily understand the Company's development directions and focus. The print and online versions of 2017 Annual Report won a number of top accolades in international competitions, including being awarded the Grand Award and 12 gold awards in "2018 International ARC Awards", as well as winning 7 gold awards in "LACP 2017 Vision Awards Annual Report Competition". The prestigious honours reflect the unanimous worldwide recognition towards China Telecom's tireless pursuit of excellence and globally leading performance on corporate governance and disclosure, on both conventional and digital channels. The Company has always maintained a sound and effective information disclosure mechanism while keeping highly transparent communications with media, analysts and investors. Meanwhile, we attach great importance to the handling of inside information and have formulated rules on information disclosures and guidelines on inside information which encompass (including but not limited to) disclosure of sensitive information and rules on confidential information, identifying the scope of inside information, procedures and management guidelines on handling inside information. In general, the authorised speakers only clarify and explain on information that are available on the market, and avoid providing or divulging any unpublished inside information either as an individual or as a team. Before conducting any external interview, if the authorised speaker has any doubt about the information to be disclosed, he/she would seek verification from the relevant person or the person-in-charge of the relevant department, so as to determine if such information is accurate. In addition, discussions on the Company's key financial data or other financial indicators are avoided during the blackout periods. Details of shareholders by type and public float capitalisation can be referred to the Report of the Directors on pages 54 to 75 of this annual report. 2 or more shareholders holding in aggregate 10% or more of the shares carrying the right to vote at the meeting sought to be held shall sign 1 or more written requisitions in the same format and with the same content, stating the proposed matters to be discussed at the meeting, and requiring the Board to convene an extraordinary general meeting or a class meeting thereof. If the Board fails to issue a notice of such a meeting within 30 days from the date of receipt of the requisitions, the shareholders who make the requisitions may themselves convene such a meeting (in a manner as similar as possible to the manner in which shareholders' meetings are convened by the Board) within 4 months from the date of receipt of the requisitions by the Board. When the Company convenes an annual general meeting, shareholders holding 5% or more of the total voting shares of the Company shall have the right to propose new motions in writing, and the Company shall place such proposed motions on the agenda for such annual general meeting if they are matters falling within the functions and powers of shareholders' meetings. Shareholders may at any time send their enquiries, requests, proposals and concerns to the Board in writing through the Company Secretary and the Investor Relations Department. A dedicated "Investor" section is available on the Company's website (www.chinatelecom-h.com). There is a FAQ function in the "Investor" section designated to enable timely, effective and interactive communication between the Company, shareholders and investors. Company Secretary and the Investor Relations Department of the Company handle both telephone and written enquiries from shareholders of the Company from time to time. Shareholders' enquiries and concerns will be forwarded to the Board and/or the relevant Board Committees of the Company, where appropriate, which will answer the shareholders' questions. Information on the Company's website is updated regularly. The Company was established in the PRC and is currently listed on The Stock Exchange of Hong Kong Limited and the New York Stock Exchange ("NYSE"). As a foreign private issuer in respect of its listing on the NYSE, the Company is not required to comply with all corporate governance rules of Section 303A of the NYSE Listed Company Manual. However, the Company is required to disclose the significant differences between the corporate governance practices of the Company and the listing standards followed by NYSE-listed U.S. companies. Pursuant to the requirements of the NYSE Listed Company Manual, the Board of Directors of all NYSE-listed U.S. companies must be made up by a majority of Independent Directors. Under currently applicable PRC and Hong Kong laws and regulations, the Board of the Company is not required to be formed with a majority of Independent Directors. As a listed company on The Stock Exchange of Hong Kong Limited, the Company needs to comply with the Listing Rules. The Listing Rules require that at least one-third of the Board of Directors of a listed company in Hong Kong be Independent Non-Executive Directors. The Board of the Company currently comprises 9 Directors, of which 4 are Independent Directors, making the number of Independent Directors exceeds one-third of the total number of Directors on the Board, in compliance with the requirements of the Corporate Governance Code of the Listing Rules. These Independent Directors also satisfy the requirements on "independence" under the Listing Rules. However, the related standard set out in the Listing Rules is different from the requirements in Section 303A.02 of the NYSE Listed Company Manual. Pursuant to the requirements of the NYSE Listed Company Manual, companies shall formulate separate corporate governance guidelines. Under the currently applicable PRC and Hong Kong laws and regulations, the Company is not required to formulate any guidelines for corporate governance; therefore, the Company has not formulated any separate corporate governance guidelines. However, the Company has implemented the code provisions under the Corporate Governance Code and Corporate Governance Report as set out in Appendix 14 of the Listing Rules for the financial year ended 31 December 2018. The Company continuously analyses the corporate governance development of international advanced enterprises and the investors' desires, constantly examines and strengthens the corporate governance measures and practice, and improves the current practices at the appropriate time; we strongly believe that by adhering to good corporate governance principles, and improving the transparency of operations, as well as the establishment of the effective accountability system, we can ensure the long-term stable development of the Company and seek sustainable returns for the shareholders and investors.